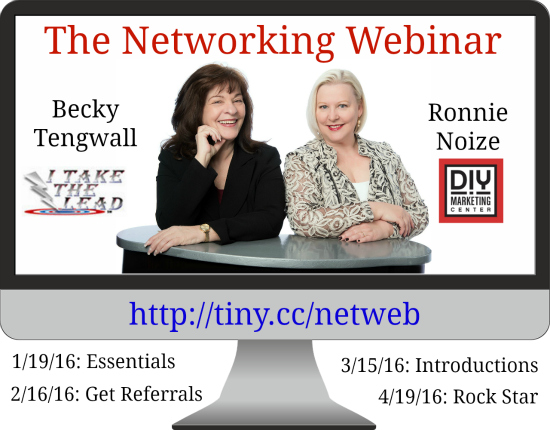 Introducing the Networking Webinar with Becky Tengwall of I Take the Lead & Ronnie Noize of the DIY Marketing Center. This fun and fast-paced 4-part webinar series is the perfect place to learn about networking secrets from insiders, secrets from the pros, and hear true stories about networking mistakes that will make you cringe--so you'll never make them yourself! Presented by networking experts Becky Tengwall and Ronnie Noize, this series shares innovative and effective strategies for networking your way to success. First up, the top five networking essentials that every networker must know before showing up at a networking event. Join us for all four info-packed high-value episodes from 3-4pm on the third Tuesday of month starting January 19, 2016. This fun and fast-paced webinar is the perfect place to learn about networking secrets from insiders, secrets from the pros, and hear true stories about networking mistakes that will make you cringe--so you'll never make them yourself! Get the video replay of the first webinar in the series now on Facebook now! I'm co-hosting a webinar, and YOU'RE invited! I have an exciting announcement. On January 21st I’ll be co-hosting a webinar with Jackie B. Peterson. Jackie is a Portland celebrity in the small business world. She has spent the last 20 years or so, cracking the traditional corporate business model to find a new way for solos, to create a successful, profitable solo business doing what you love: making and delivering your product or service! I hope that you will join Jackie and me on Thursday January 21st at 11am PT for an exciting introduction to her revolutionary business method. It will change your life because it works. In 60 minutes Jackie will walk you through the seven steps to successfully start your own solo business, answering your questions as she goes. I know you will come away from the experience both enlightened and empowered. The webinar is FREE and I am certain it will change the way you think about your potential to earn a living doing what you love. If you want a career in health care or the creative arts this webinar is for you. how to thrive as you grow. One of the most revolutionary ideas that Jackie will talk about is how to avoid having employees that will put you into management and keep you from doing, hands on, the work you love. I look forward to seeing you on the webinar, Thursday, January 21st at 11am. Please join me!